Dave Bautista, better known by his stage name Batista, is an American professional wrestler, actor and mixed martial artist. He singed with the WWE in 2000, and over the course of his wrestling career, he has won World Heavyweight Champion four times and the WWE Champion twice. He has also won the Royal Rumble twice, the World Tag Team Championship three times, and the WWE Tag Team Championship once. He holds the record as the longest reigning World Heavyweight Champion at 282 days. He is one the successful actors in the industry today with his breakout role as Drax the Destroyer in the Marvel Cinematic Universe films such as Guardians of the Galaxy series and Avengers: Infinity War. Batista was born on January 18, 1969, in Washington, District of Columbia, USA. He is currently 50 years old. He has Greek and Filipino ancestry. Batista attended Wild Samoan Training Centre. Bautista was married to his first wife Glenda from 1990 to 1998, with whom he has two daughters, Keilani (born in 1990) and Athena (born in 1992). He married his second wife Angie on October 13, 1998, however, this relationship also didn’t last long and they divorced in 2006. He married his third wife Sarah Jade, a competitive pole dancer, in October 2015. He has two grandsons: Jacob and Aiden. Some data has his height as 6 feet 4 inches or 193 cm. While pursing bodybuilding career, Bautista decided to become a wrestler and got trained at the Wild Samoan Training Center wrestling school by Afa Anoa. He made his wresting debut as Khan on 30 October 1999. He signed with the WWE in 2000, eventually adopted his ring name Batista, and made his WWE in-ring debut in a tag team match teaming with D’Von against Faarooq and Randy Orton in 2002. Batista had his first acting role as a wrestler in the 2006 comedy film, Relative Strangers. His role was uncredited in the film. His first credited acting role came in 2009 when he was cast as a Police officer in the American-German film, My Son, My Son, What Have Ye Done? In 2006, he appeared as Aidar in an episode of the television series, Smallville. His role as Drax the Destroyer in the Marvel Cinematic Universe, portraying the character in the films Guardians of the Galaxy (2014), Guardians of the Galaxy Vol. 2 (2017), and Avengers: Infinity War (2018). Batista has done endorsement works and ad campaigns for WWE SummerSlam (2004), Nutrabolics (2007), Muscle and Fitness. 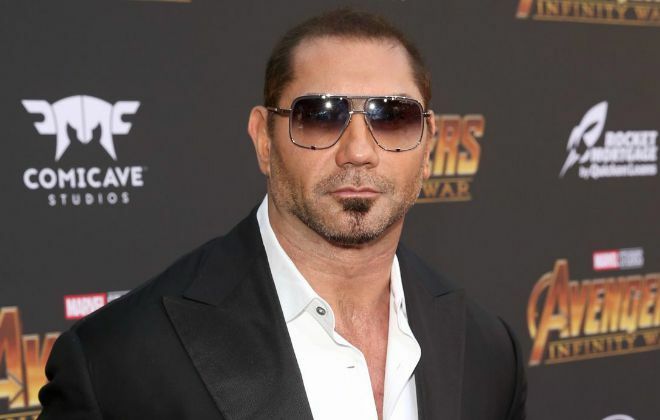 Batista has a net worth of $13 million. His parents divorced when he was young and he was raised by his mother. His mother was a lesbian and he had considered himself as “a proud son of a lesbian”. He left home at the age of 17 and started living on his own. He worked as a bouncer for various nightclubs and also worked as a lifeguard before taking bodybuilding as his career full-time. Batista entered the wrestling world in 1999 and fought for the brand WWE for over a decade. He was a former member of Evolution with Triple H, Randy Orton, and Ric Flair. He holds the record for having the longest reign of 282 days as the World Heavyweight Champion. Before the age of 40, Batista had already become the grandfather of 2 grandsons Jacob and Aiden by Keilani (his first daughter). He holds a purple belt in Brazilian jiu-jitsu under the tutelage of Cesar Gracie. Bautista made his MMA debut against veteran journeyman fighter Vince Lucero on October 6, 2012, and eventually won the match via technical knock down. Bautista published his autobiography titled ‘Batista Unleashed’ on October 16, 2007, via Pocket Books. He recorded some of the most controversial issues in his life, including his relationship with Chris Benoit in the book. He appeared on the cover of the April 2005 Flex and Muscle & Fitness for September 2008. He is a collector of vintage steel lunchboxes. Batista has many tattoos on his body, including a dragon on his back, the word “Angel” written in red Kanji lettering on his upper left biceps as a tribute to his former wife, Angie, a signature design on his upper right biceps, and the sun on his stomach, surrounding his belly button. He also has the flags of the Philippines and Greece tattooed on his arm. Batista reunited with the rest of Evolution for an appearance on SmackDown’s 1000th episode on October 16, 2018.